Habitat for native bees has two major components: a place for the nest and flowers to forage. 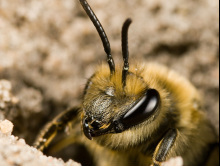 Most native bees nest in the ground, and prefer native soil. Adding organic matter to your soil will often change the soil’s composition and discourage the arrival of native bees. So be certain you leave a few areas of your garden untouched. Plus, since most native pollinators are ground dwellers, limiting pesticides is very important. Although honey bees are not too choosy about the type of pollen they eat, some native bees are a bit picky. Native bees are more abundant in native habitats. So a sure-fire way to attract native bees is to have a few flowering native plants in your landscape. Plant standards and heirlooms vs. hybrids if you want to attract more natives.